Shoestring Budget Travel! Enjoy Seoul on 10 Dollars! Traveling overseas may seem expensive, but it's also possible to enjoy a full vacation on a limited budget. Seoul, in particular, is a popular city to visit, thanks to the multitude of free or nearly free attractions, as well as the plethora of good eats and the unique harmony of traditional and modern styles meeting. If you are finding it hard to believe, keep reading to find out how you can enjoy a variety of areas in Seoul for just 10 dollars each! 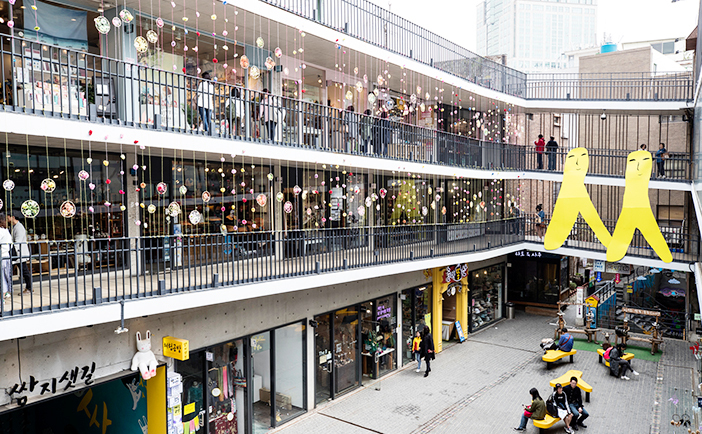 Located between Anguk Station (Seoul Subway Line 3) and Jongno 2-ga is Insa-dong, a cultural space where traditions and modern life blend seamlessly. Stretching out on both sides of the approximately 700 meter main street are shops bursting with crafts, artworks, and souvenirs. In particular, the square-shaped cultural complex of Ssamziegil is immensely popular. 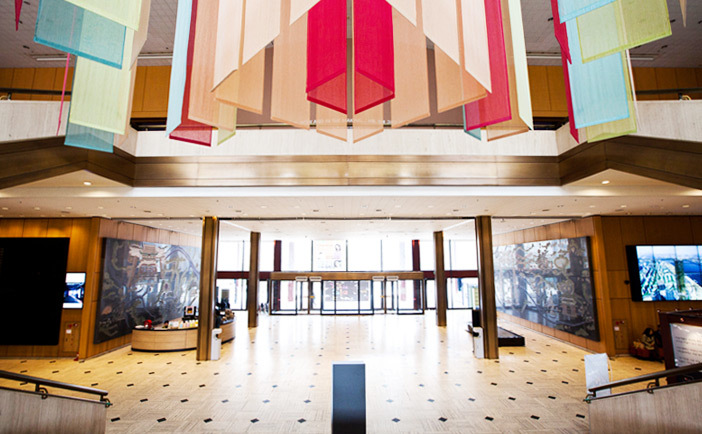 Each floor offers a unique selection of small crafts and clothing as well as snack vendors. It is extremely difficult to resist the temptation of street foods and brightly colored souvenirs as you walk through Insa-dong. 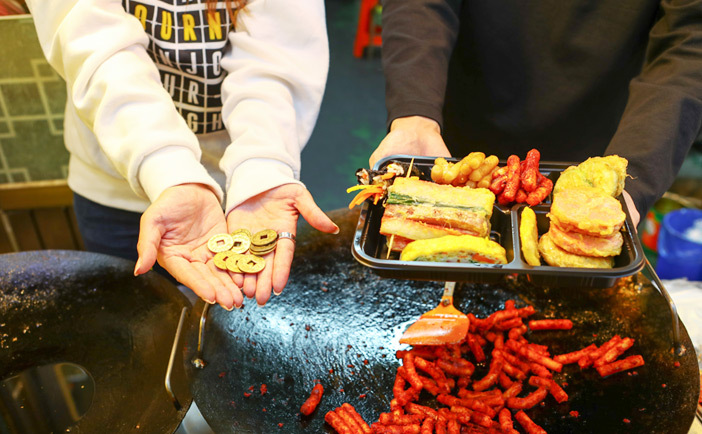 The street food is generally priced around 2,000 to 3,000 won for one item, while fans, bookmarks, pencil cases, and luck pouches are some of the more popular, inexpensive gifts, available for 3,000 won or less. Another unique way to experience Insa-dong is by visiting one of the tea houses or small galleries located inside hanok buildings, Korea’s traditional housing. 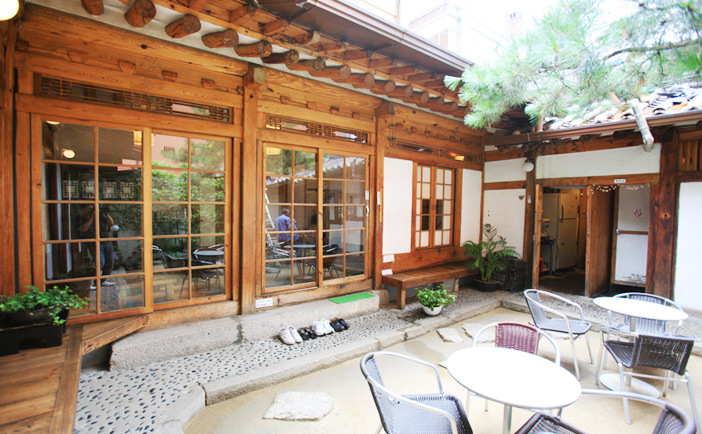 While exploring Insa-dong, take a moment to stop into one of these hanok cafés for a short break! Also located in Insa-dong is Museum Kimchikan, providing an opportunity to enjoy the UNESCO-recognized gimjang (kimchi preparation) culture. The museum was selected in March of 2015 by the American broadcasting network CNN as one of the world's top 11 food museums. The museum includes exhibitions on the history of kimchi and the many types, as well as a space to try kimchi. Audio guides are available for free in English, Japanese, and Chinese to facilitate understanding of the displays. * 10 dollar budget for Insa-dong! - Directions: Anguk Station (Seoul Subway Line 3), Exit 6. Walk approx. 3min. - Directions: Anguk Station (Seoul Subway Line 3), Exit 6. Walk approx. 8min. Samcheong-dong is the neighborhood located northeast of Gyeongbokgung Palace, and its main road has become a representative cultural street of Seoul due to the many cafés, galleries, and unique restaurants. The area is enjoyable regardless of age or gender, with special attractions like the World Jewellery Museum, Owl Art & Craft Museum and more. Enter any one of the countless cafés lining the street that draw your fancy to take in the ambience of Samcheong-dong over a cup of coffee. We recommend getting a window seat or a table on the terrace to enjoy the active street scene. Within walking distance to Samcheong-dong is Bukchon Hanok Village, a well-established community of traditional houses that are still lived in today. Tourists are advised to take special precautions to control noise level and avoid littering in respect of the residents who live in the neighborhood. Wandering through the streets and many connecting alleyways, you can find plenty of things to see, from craft workshops and museums of all themes to perfect photo spots. * 10 dollar budget for Samcheongdong-gil Road & Bukchon Hanok Village! - Directions: Anguk Station (Seoul Subway Line 3), Exit 1. Walk approx. 15min. - Directions: Anguk Station (Seoul Subway Line 3), Exit 2. Walk approx. 10min. Seoul Museum of History is a great place to visit for people curious about the transformation of Seoul into a major international city. 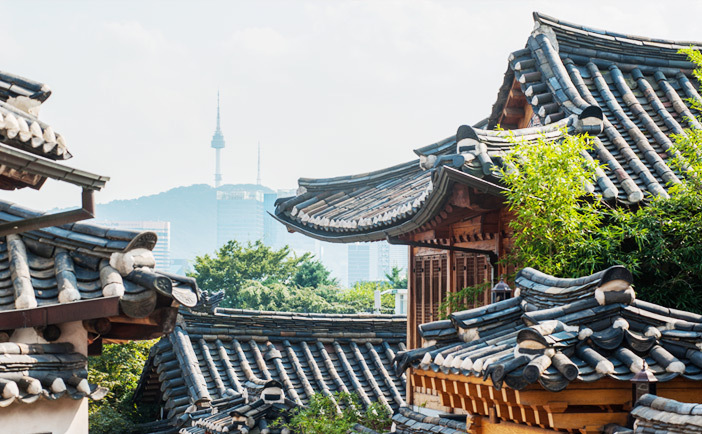 The capital city for over 600 years since the Joseon Dynasty (1392-1910), Seoul has a long history and the museum has a variety of exhibitions and artifacts showcasing this. Visitors can learn more about the story of Joseon's kings and royal palaces, as well as see the clothing and daily items used by citizens in the past. The outdoor exhibition is popular for the display of a tram car that ran through the city of Seoul from the 1930s until 1968. The car and statues of people in traditional clothing bring the vibe of the old city to life. The museum has a variety of free resources for international tourists to use. Audio guides are available in Korean, English, Japanese, and Chinese, and guests can also read about the exhibitions through a smart phone application. Exiting Seoul Museum of History, the road leads to Gyeonghuigung Palace. 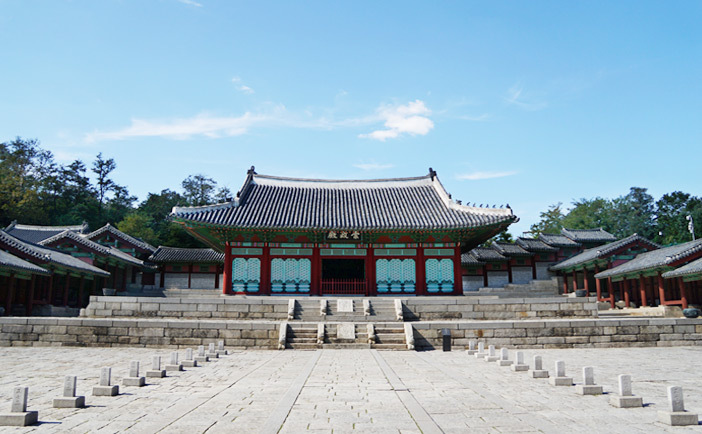 This palace was used in the later part of the Joseon period as a secondary palace. In the past, Gyeonghuigung Palace had some 100 buildings, both large and small, but most of the buildings were damaged due to various causes, and the size of the palace has been reduced by nearly half. These days, many of the buildings have been reconstructed thanks to the efforts of the city, and the palace is open to the public. Compared to the other royal palaces, Gyeonghuigung Palace is rather small, but the palace is gradually growing as more and more buildings are restored. * Touring Seoul Museum of History & Gyeonghuigung Palace is free! - Directions: Gwanghwamun Station (Seoul Subway Line 5), Exit 7. Walk approx. 10min. 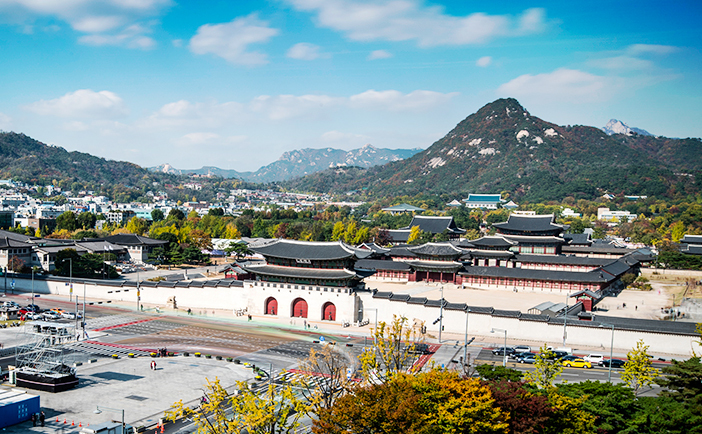 Gyeongbokgung Palace is a symbol of the Joseon era in the heart of the city. 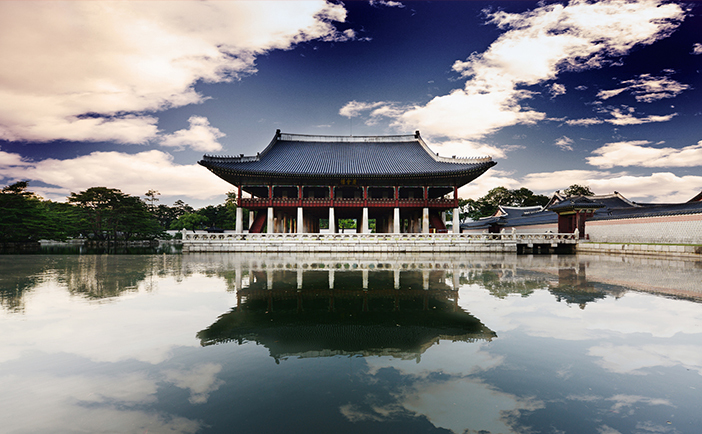 Exceptionally beautiful structures within the palace grounds include Geunjeongjeon Hall, where the king conducted court affairs, and Gyeonghoeru Pavilion, a large open pavilion appearing to float atop a man-made lotus pond. Enjoy a leisure stroll through the palace to take in the many attractive buildings. Exchange brass coins for food in Tongin Market’s Dosirak Café! Located next to Gyeongbokgung Palace is Tongin Market, a traditional market that is popular among tourists. Visitors to the market absolutely must try the dosirak (lunchbox) café! The café offers a fun experience where you exchange cash for yeopjeon, brass coins that were used as currency in the past, and use these coins to purchase foods from the vendors for your own personal lunchbox. The dosirak café is located in the middle of the shops lining the long market alley. For just 5,000 won, you get 10 yeopjeon and a dosirak container to start filling up. Take your time walking through the market and looking at the many food vendors to find things you want to eat. When you find something you'd like to try, buy it with your yeopjeon! If you spend all your coins but still want to buy more, you can also purchase it with cash. After completing your lunchbox, return to the dosirak café to eat. The café has chopsticks, spoons, and forks to use, and sells rice and soup to round out your meal. * 10 dollar budget for Gyeongbokgung Palace & Tongin Market! - Directions: Gyeongbokgung Station (Seoul Subway Line 3), Exit 5. Walk approx. 2min. - Directions: Gyeongbokgung Station (Seoul Subway Line 3), Exit 2. Walk approx. 10min. 1988 Seoul Olympics. To this day, the park is used as a venue for a multitude of sporting events and concerts. The park is also home to over 200 sculptures from internationally famous artists, and was the site of Mongchontoseong Fortress, a relic from the Baekje Period (18 B.C. – A.D. 660). When visiting the park, we highly recommend stopping by one of the information centers first to pick up a free map of the park. The map is extremely helpful when choosing which of the park’s many attractions and facilities to visit, as well as finding the best way to get to all of them. There are two information centers, located on opposite ends of the park at Meeting Plaza and Peace Plaza. 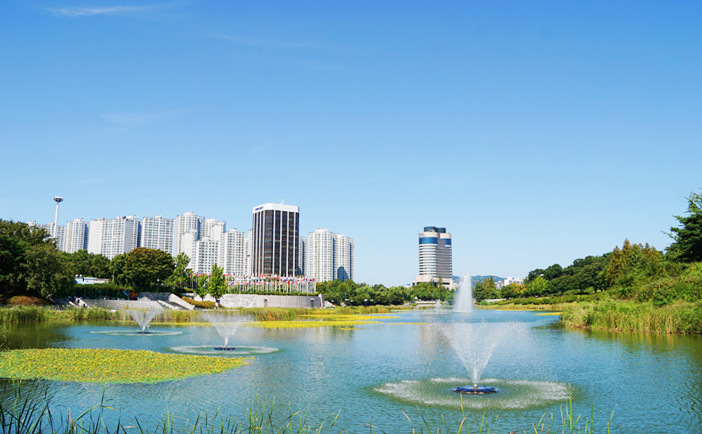 After picking up your map, be sure to head to the park’s major attractions, namely Mongchontoseong Fortress, Wild Flower Garden, Rose Garden, and One Tree Hill. Walking through the entire park would take around two or three hours. For a special experience and a more enjoyable way to get around, take advantage of the bicycle rentals available at the park! Visitors can rent bicycles for two, three, and six people. The rental fee varies by bike and day of the week, but weekend and public holiday fees for one hour are as follows: two-person bicycle 8,000 won, three-person bicycle 15,000 won, and six-person bicycle 25,000 won. * 10 dollar budget for Olympic Park! - Directions: Olympic Park Station (Seoul Subway Line 5), Exit 3 or Mongchontoseong Station (Seoul Subway Line 8), Exit 1.